I’m excited to build-upon the official announcement from iSchoolMusic.org (iSchoolsMusic) and it becoming a FREE resource and tool for all music teachers! iSchoolMusic, like many things destined to be great, started out very small, but had a core of people to dedicated to its concept and development. 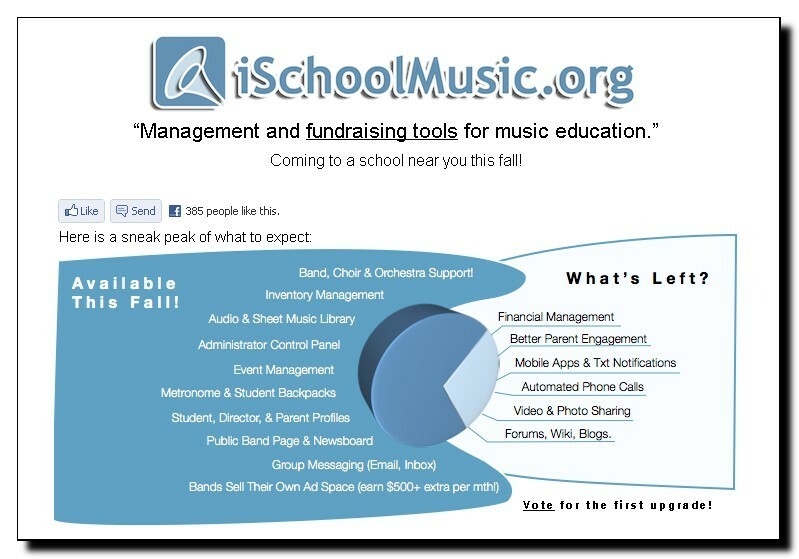 Initially, iSchoolMusic got its start as iSchoolBand.com and was more centered on supplying the needs of instrumental music directors. After a short time, they realized that the program would be perfect for ANY ensemble director, thus the “germ” of the idea to expand the scope of the software to accommodate the various types of ensembles and become freely accessible to all started to take root. Under the founding leadership of Chris Purifoy and Cole Thornton, the iSchoolMusic phenomena has grown from a small number of early-adopters to its current size comprising of just over 1,000 individuals, schools, and districts! Interestingly, Chris and Cole started the company on a “shoe-string” budget along with the noble thought of helping to keep music education in the schools by eliminating some of the costly administration and time involved with managing band programs. If music teachers could spend less time with the administration of their groups, then it would make sense that they would be able to spend more time actually teaching music and creating opportunities that provide all of the creative benefits that go along with it. That “little” company is now one of the largest growing philanthropic endeavors in music education and has a board of directors comprised of music teachers and ensemble directors from around the country —it’s hard to believe that this type of music administration software is now being made available to everyone for free! At its basic level, iSchoolMusic is a complete, web-based, music administration and ensemble communications environment that also includes fund-raising and revenue generating features. It includes many software modules to help simplify the various duties and tasks that music ensemble directors would be presented with as part of their daily routines: event management, inventory management, metronome, messaging, etc. Part of the iSchoolMusic communication package includes secure messaging for the students, an internal content management system (CMS), and the ability to produce an integrated, external, public web page. There are also a number of modules that are currently in development including: automated phone calling, video and photo sharing, and mobile application integration with smart devices. The product continues to evolve based upon new technology advances and feedback from both the students and directors. Something this useful to music educators could not have come at a better time and the price-point could not be any better (again, it’s free!). Fine arts budgets and programs are currently being limited and eliminated in many parts of our country (and in others) and the likelihood of many of them being able to afford something like this at true retail pricing would be small at best. Thankfully, iSchoolMusic is being offered at no-cost and can be accessed easily by virtually any school’s existing computer platforms due to the cloud-type nature of the program. Every single deployment of iSchoolsMusic will include an optional “donation hub” component that may be utilized to generate community-based funding. Another fund-generating feature of the software is the option for schools to manage and sell advertisement spaces within their own iSchoolMusic sites; this creates multiple school-chosen, user-selected, opportunities for creating further revenue streams. Again, incredibly useful features that make the no-cost price point even better! iSchoolMusic is currently accepting schools for its startup launch, but because of stability and scalability purposes is limiting entry to a set number of open-enrollment periods that will be spread throughout next year. Teachers may request enrollment into the iSchoolMusic family by visiting the URL: http://ischoolsmusic.org. I strongly encourage every school music director to try this software and put it to good use —it will not disappoint.